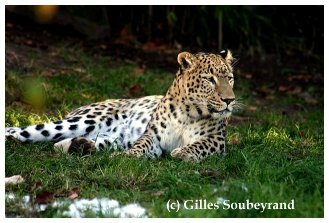 ~ the leopard has a look of deer-brown to gold-black with large rosettes on the back up to the legs. This coat pattern is related to the jaguar. Instead of the black spots inside the rosettes, the leopard has a dark-brown colouring. Furthermore the coat pattern on the chest is spotted. On the chest, the belly and the inside of the legs the coat turns into light brown to white. ~ the average age is up to 15 years. Sometimes, leopards reach an age of 23 years in captivity. ~leopards usually live lonely, rarely they form small groups. ~ the mating time is in different seasons to complete annual (depending on the region). The time of pregnancy is between 90 and 105 days. A litter consists of 1 to 7 cubs - normal are 2 to 4 cubs. By the high baby mortality rate usually only 2 cubs of a litter survive. 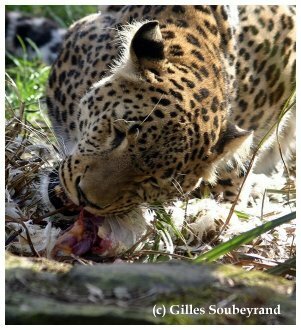 ~ as dawn - and night animals, leopards perform a very energy saving hunt. The first kind of their hunt behavior is the creep up. They creep up to their victim several meters, in order to tear it down with an enormous jump and to finally kill it. The second kind is to lie in ambush and to wait until the unsuspecting prey comes. According to the menu, the cat eats everything from small mouses, birds, apes, antelopes and buffalos up to reptiles. ~ the cat is killing the prey via neck bite or throat bite. Immediately after the hunt it tears up the victims belly, takes the entrails out and digs these. Afterwards the leopard drags its prey on a tree, and nourishes itself on it several days.